For many remote Aboriginal communities, it can be quite challenging to get hildren to enjoy a solid education. According to Australian government statistics, the education levels for indigenous people are higher within metropolitan areas. Reasons for this vary from overcrowded households and a lack of ‘management’ thereof, to a lack of sufficient funds to arrange for transport to local schools on a day to day basis. 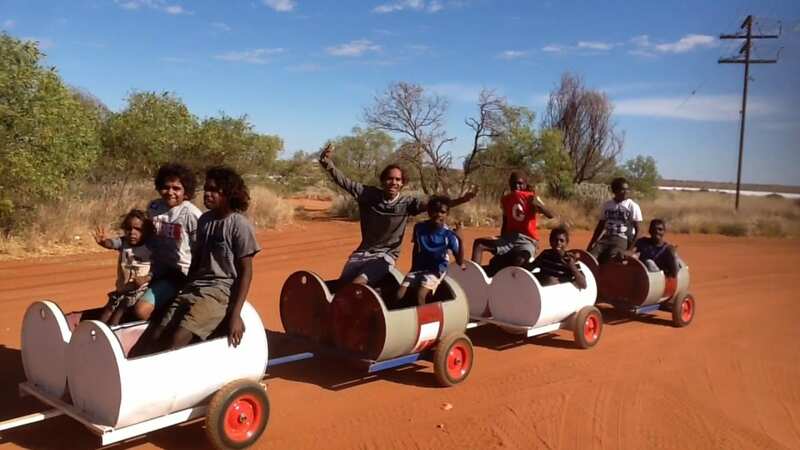 Johns’ initiative involved the construction of a novelty barrel train made from old drums, to raise school attendance of young kids within his Aboriginal Pilbara community in South West territories. Reaudavey reported to ABC News that he got the idea from a visit to Perth, where he saw four old drums with children being towed about by a ride-on mower for kids. He immediately thought it was a great way of getting the children in his local community to school in the early morning and back home after a full day of education, and the rest of Punmu quickly embraced the idea. On top of that, the children really seem to enjoy the fun of traveling to school together. – John Readavey, community coordinator in Pilbara. According to the Australian government, school attendance in Pilbara has risen substantially since the introduction of the barrel train, stating that most of the parents within the Punmu communities used to have difficulties getting their children to school on time and picking them up. With the financial support of community friends Donald Graham and Peter Doery, the whole community assisted to construct the train, making it robust enough to withstand the local terrains.